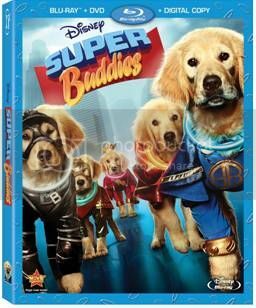 Disney’s beloved and adorable ‘Buddies’ are back in a hilarious all-new movie for the whole family -- ‘SUPER BUDDIES’ debuts August 27, 2013, on Blu-ray™Combo Pack and DVD. An action-packed canine adventure, ‘Super Buddies’ stars the world’s most adorable talking puppies - Rosebud, B-Dawg, Budderball, Buddha and Mudbud, as caped crusaders em’barking’ on their biggest adventure ever. I have never seen any of the other Buddies movies but I jumped on the chance to review this one and I have to say I am glad I watched it because this movie is funny and cute. The movie is well done and the acting is good. This movie is a must see for the whole family.